Genuine Boulder Turquoise set in Sterling Silver Pendant. Free 18" Sterling Silver Chain with purchase. 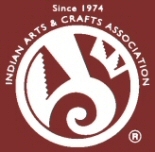 Created by Navajo Artist Phillip Sanchez. Signed by the artist. The cabachon is Boulder Turquoise you can see the veins of Turquoise running through the host rock. The Boulder Turquoise Mine is located in northeast Nevada. It was discovered in 1970 by a Shoshone sheep herder. Production is small due to the remote location and winter weather. 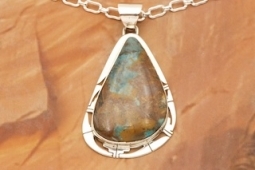 Boulder Turquoise is valued for both it's beauty and rarity. Every stone is unique.